Call it an ancient thousand man march. Early Bronze Age men from the vast grasslands of the Eurasian steppe swept into Europe on horseback about 5000 years ago—and may have left most women behind. This mostly male migration may have persisted for several generations, sending men into the arms of European women who interbred with them, and leaving a lasting impact on the genomes of living Europeans. “It looks like males migrating in war, with horses and wagons,” says lead author and population geneticist Mattias Jakobsson of Uppsala University in Sweden. Europeans are the descendants of at least three major migrations of prehistoric people. First, a group of hunter-gatherers arrived in Europe about 37,000 years ago. Then, farmers began migrating from Anatolia (a region including present-day Turkey) into Europe 9000 years ago, but they initially didn’t intermingle much with the local hunter-gatherers because they brought their own families with them. Finally, 5000 to 4800 years ago, nomadic herders known as the Yamnaya swept into Europe. They were an early Bronze Age culture that came from the grasslands, or steppes, of modern-day Russia and Ukraine, bringing with them metallurgy and animal herding skills and, possibly, Proto-Indo-European, the mysterious ancestral tongue from which all of today’s 400 Indo-European languages spring. They immediately interbred with local Europeans, who were descendants of both the farmers and hunter-gatherers. 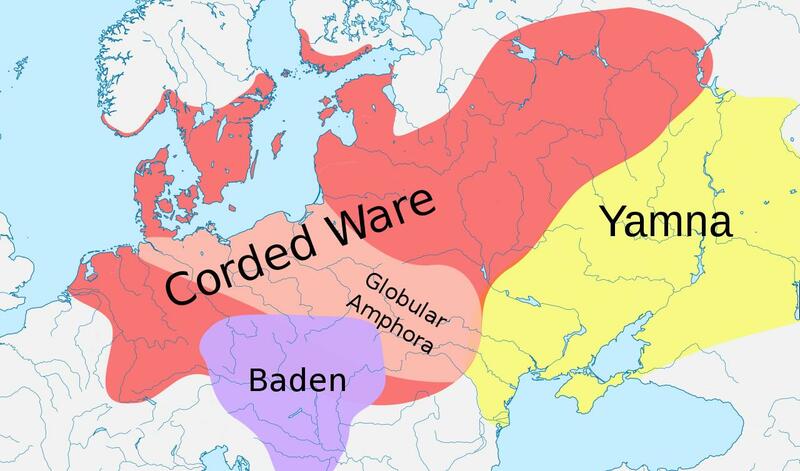 Within a few hundred years, the Yamnaya contributed to at least half of central Europeans’ genetic ancestry.